The Red Dot is inarguably the most important and widely recognized of all design awards. The Red Dot organization awards prizes for design in a multitude of categories, from refrigerators to lawn mowers and everything in between. Prizes are also awarded on many levels: Best of the Best, Design Prize, and Honorable Mention. Until the 2015 edition of the competition, there was no dedicated watch category. That thankfully changed, and now the prestigious German prize counts a three-man jury dedicated exclusively to watches, including Rüdiger Bucher, editor-in-chief of German watch magazine Chronos and head of editorial for the watch division of the Ebner Verlag publishing house; freelance journalist Gisbert Brunner; and Swiss-based designer Simon Husslein, who has been responsible for the designs of a few Nomos and Ventura watches among others. See The 2015 Red Dot Has A New Watch Category. And The Winners Are . . . for a full interview with Bucher on the creation of the new timepiece category and what goes on behind the scenes at the Red Dot. The Best of the Best is the highest honor, and in 2019 only one traditional watch from the hundreds entered achieved this status: the Porsche Design 1919 Chronotimer Flyback Brown & Leather. Porsche Design’s 1919 line got a new flyback chronograph at Baselworld 2018, making it the first unlimited timepiece to be outfitted with the Porsche offshoot’s own Caliber Werk 01.200, which you can see in Porsche Design Introduces First In-House Chronograph Movement, But This Timepiece Is Exclusively Available For Owners Of Porsche’s New 911 Turbo S Sports Car. One of the lovely things about this unlimited timepiece is its beautiful brown color, which still retains the low-key purist values of this brand inspired by the aesthetics of the Porsche 911. For more information, please see Working That Credo: Porsche Design 1919 Chronotimer Flyback Brown & Leather. Some of the 2019 winners of the Red Dot Design Prize like Maurice Lacroix, Moritz Grossmann, and Qlocktwo have won in this category before, but the majority of these brands have been awarded a prize for the first time this year. Without further ado, here is the list of the ten 2019 Red Dot winners in the design category. Human eyes like symmetry – it is evolutionarily programmed into us – so when a timepiece can achieve a perfect, mirrored layout, it will stand out. That symmetry helps the wearer to use this watch more efficiently, and so the dual time display on Armin Strom’s Dual Time Resonance becomes easier to use compared to the co-axial display seen on many GMT pieces. The Dual Time Resonance’s layout is driven largely by the construction of a movement that is perfectly symmetrical thanks to the fact that it comprises two independent movements, one of which allows one dial to be used for home time and the other as a second time zone (GMT) – or as stated by the brand, a countdown timer or a passive minute and hour chronograph. A center subdial showing a 24-hour display with one hand driven by each movement makes it clear which dial is set for which time. Since the time displays are independent of each other, any use can be applied to the second dial while ensuring both remain equally consistent thanks to the Resonance Clutch Spring that keeps this timepiece in perfect resonance. 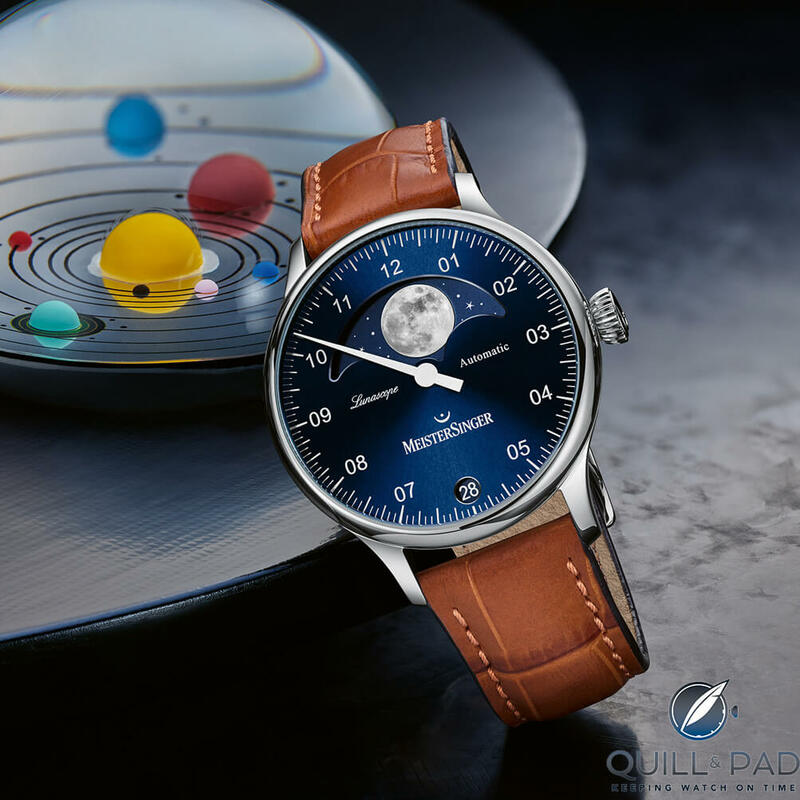 This is a most unusual Meistersinger watch thanks to its glaring moon phase display. Despite the additional function taking up most of the upper half of the dial, it remains eminently recognizable as a product of the German brand thanks to its single hand making rotations around the dial to show the hour and minute. This model won an IF Design Award earlier in 2019. For more information, please visit www.meistersinger.com/en/collection/single-hand-watches-models. The purity of the Moritz Grossmann Atum line is turned on its head here: by bringing a view of the movement to the dial side, the Glashütte-based brand’s high-quality finish becomes visible even as one reads the time. A highlight is seeing the hand-engraved balance bridge out in the open. For more information, please visit www.en.grossmann-uhren.com/watch/backpage-rosegold. Maurice Lacroix has been a recipient of Red Dot awards for many years now. The latest winner of this important prize is a skeletonized version of the recently revived Aikon collection. For more information, please visit www.mauricelacroix.com/ch_en/aikon-automatic-skeleton-manufacture. Showing the time in words is realized here with an impressive amount of charm: on Qlocktwo 110 letters indicate the time; the words on this clock’s large surface, available in 20 languages, change every five minutes. The four illuminated dots in the corners ensure the exact minute display, while the time is set using the Flashsetter app. And this year’s award-winning Qlocktwo 180 Creator’s Edition Silver & Gold goes far beyond its original time-display purpose with its impressive size to become a defining part of a room, a perfect contrast between room-filling presence and minimalist design. Quiet and free from hectic activity, the clock’s 12-karat white gold alloy consists of equal parts of silver and gold, applied by hand and refined in an elaborate patination process achieving random surface structure. For more information, please visit www.qlocktwo.com/en/qlocktwo-creators-edition. A Chronoswiss Flying Regulator model was awarded in the 2017 edition of the Red Dot, and this year sees a variation on that theme taking a prize home. Chronoswiss had some trouble finding a new design identity when the company changed hands back in 2012, which might explain why the Flying Regulator has been received so well by the jury: its design strongly reminds one of Chronoswiss’s heyday, during which company founder Gerd-Rüdiger Lang brought the regulator dial to wrist-borne timepieces, thereby creating a new wristwatch design category. For more information, please visit www.chronoswiss.com/en_ch/sirius-flying-regulator-night-and-day. For more information, please visit www.stowa.de/Flieger+Verus. This maker of tool watches entered a watch into the Red Dot competition for the first time – and obviously it was the right choice. The jury was apparently impressed by the sporty look of this watch developed especially with emergency medical personnel in mind. For more information, please visit www.sinn.de/en/Modell/EZM_12. This Berlin-based watch manufacturer offers Made in Germany quality with Bauhaus style, Black Forest-made dials, assembly in Germany, and Swiss movements. For more information, please visit www.lilienthal.berlin/zeitgeist-silver-silver-brown. With a 3.5-inch LCD screen, this is more than just an alarm clock. One can use it to share pictures, leave voice messages, access more than 5,000 smart devices, and listen to a huge amounts of audiobooks. For more information, please visit www.suningholdings.com. Smartwatches were judged by the same three-man jury, but put into their own category this time. The winner of the Best of the Best Red Dot here is the Apple Watch Series 4, while Red Dot Design winners include the following: Sequent SuperCharger (a self-charging smartwatch), Mobvoi Ticwatch E2, Mobvoi Ticwatch C2, Anhui Huami Amazfit Verge, LG Watch W7, and Medion Life E1800. I honestly think my dog could win a Red Dot Design Award – and I don’t even have a dog. The idea that Maurice Lacroix should be multiple winners in this award is laughable; Stowa have been rocking out versions of that derivative Flieger design for years – what makes it suddenly award-worthy? Oh hang on, the following, from the Red Dot website, seems pertinent, though more pertinent still would be to know how many brands actually bothered to enter, was there a shortlist and which watches were discarded to end up with this sorry winners list? Costs per award are excl. of VAT. In the case of struggling brands like Maurice Lacroix, Moritz Grossmann and Chronoswiss, one might say that the willingness to cough up for the privilege of calling yourself an award winner reflects a desperation entirely in keeping with their standing in the market. Could not agree more. These awards are totally meaningless.